Happy feast of Our Holy Father Saint Francis! There has been much buzz and controversy surrounding our present Pope these days. If you take the time to read the whole text of what he says – take in the context – you will see how grossly he has been misinterpreted. 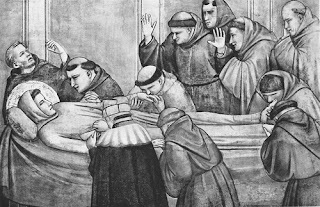 This reminds me of a similar situation surrounding Saint Francis of Assisi. We friars often run into people who tell us that they love Saint Francis: the birdbath, the garden statue, the proto-hippie, the tree-hugger, etc. 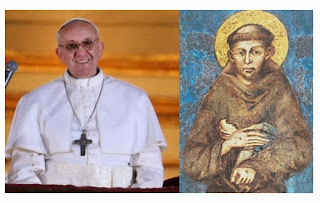 If you take the time to learn about the real Saint Francis – take in the context – you will see what a great little man he was! Saint Francis was a great lover. First of all he loved God. Secondly, every creature made by God, because art reveals something of the artist. Francis had a great love for Jesus and His Church – including a special love for the pope, the bishops, and priests (even bad ones)! Francis was deeply devoted to the Holy Eucharist and dear Mama Mary, too. Of course he loved Jesus in the poorest of the poor as well. Historians have discovered just how shocking of an influence Saint Francis was in his day, his context. Over 800 years later, we are still feeling the tremors and aftershock of his yes to God. May he pray for us from heaven so that we can say yes to God in our lives. As he told the brothers from his death bed, "let us begin again..."